The Shallows is an easy movie to dismiss. Blake Lively in a bikini plus a human hunting shark equals a simple sell. You don’t expect a lot, maybe rightfully so due to its B-Movie sensibilities. And yet time and time again this film surprised me. I understand how corny it must sound for me to say, but it’s absolutely vital for survival thrillers to have more than meets the surface. Director Jaume Collet-Serra has made a movie that’s as breezy as it is intense, capturing the loneliness of isolation and the hope of salvation on an open water rock stuck between a secret beach and a place in the distant horizon. In the struggle of woman against nature, the story uses its own ingenuity to advocate resourcefulness as a means of overcoming the unthinkable. Most movies shrink when faced with such adversity. The Shallows refuses to do so, and is all the better for its perseverance. Still reeling from the recent passing of her mother, med student Nancy (Lively) travels to the beach where here mom used to surf. It’s an unknown location, tucked away and relatively secluded. As most people do in such circumstances, Nancy grieves by going to the place her mother loved most, trying to imagine the feeling of her presence. We sense this character in every scene even though we never see her. What’s interesting about The Shallows is that Nancy’s place to find peace is also a danger zone. The underwater threat looms and lurks around the entire film and we know it’s there, somewhere, patiently waiting to strike. As she fights to survive, Nancy faces the shark head on. She must be quick, smart, determined. Those qualities and her medical background give her an upper hand. It’s not the shark she is fighting against though; it’s the externalization of her sorrow. 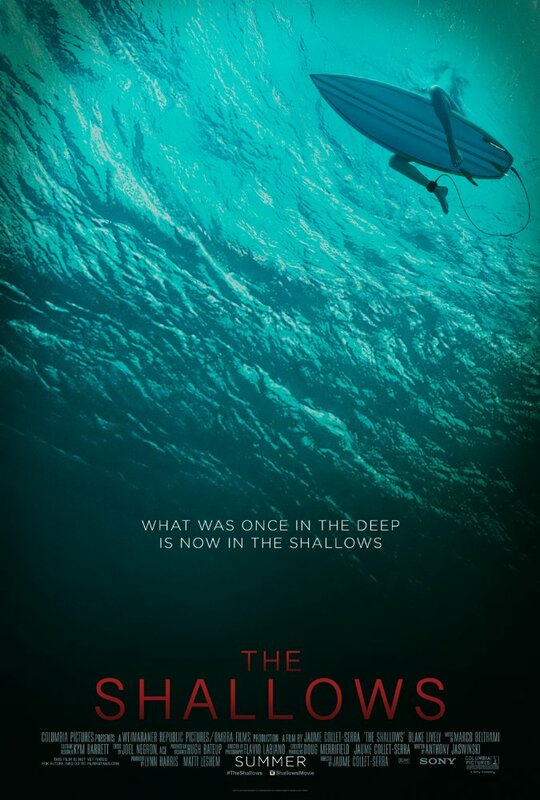 The Shallows gives us a visual representation of true melancholy and pits the lead character against it, seeing if she can overcome to be whole once more. The movie is smart in that sort of way, keeping the streamlined story compact but also having an emotional foundation to justify the actions. We see Nancy’s reactions and know where they evolve from. Collett-Serra’s movies have always landed in the genre fair with highly stylized and colorful stories. The Shallows is by far his most effective film, so nimble and lean and straightforward. There’s depth to this one though because of Lively’s physical performance. She’s injured and hurt, and Lively really sells those moments well. But with her hushed, smoky delivery, you feel her emotional attachment to things she has lost even more. I don’t think this will become one of those unforgettable survival pictures tied to time, but I do believe it will surprise audiences with its constant tension and ability to spike your heart rate. The Shallows is both bold and original, and effectively communicates why we must all conquer our fears.